"I purchased my first bottle of Tamanu oil from you at the markets in South West Rocks a couple of weeks ago and I have to tell you, that after trying several traditional remedies for eczema, I am pleased to tell you that after just ONE application of Tamanu oil, most of the redness was gone and ALL of the terrible itch associated with it was gone as well. 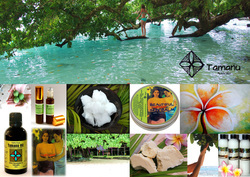 "Thank you for the bottles of Tamanu Oil, which have worked on me in an amazing way. I will be forwarding you some photos of the effects. I am the perfect pupil for your oil, with fair skin and having many years at sea and the resulting damage. Your Tamanu Oil is a breakthrough for me and I am so grateful". All your Skin will ever need..
Look for 'Special Offer' in Shop..
To have a direct and positive contribution to small village economies in Vanuatu. The isles of Vanuatu are rich in beauty, pristine environment, traditional culture and generous people. Their agricultural produce defines the very elements of this healthy and abundant land.